The Museum Association of Taos is making it easier than ever to get the most out of its participating institutions—the E.L. Blumenschein Home, La Hacienda de los Martinez, Taos Art Museum at Fechin House, the Harwood Museum of Art, and the Millicent Rogers Museum—with its Museum Association of Taos Super Ticket. For just $25, museumgoers can visit each of the five Taos museums one time, and the ticket will be honored for an entire year. If you run out of hours to visit all the museums, the ticket is also transferrable to another art-loving friend or family member. It’s a great, low-cost way to soak in the vast art history and culture of Taos and northern New Mexico. New in April to the Fechin House is Intimate and International: The Art of Nicolai Fechin Shown at His House and Studio (April 11–September 21), which gives visitors the opportunity to witness all of Nicolai Ivanovich Fechin’s (1881–1955) creative endeavors, including paintings, drawings, and sculpture, in the home he built for his family in Taos in the late 1920s and early 1930s. To sweeten the pot for locals, all the museums are free for Taos County residents on Sundays, and the Millicent Rogers Museum is free to Taoseños every day of operation. To learn more about the museums and the Super Ticket, visit the association’s website (taosmuseums.org). In Santa Fe, the New Mexico History Museum/Palace of the Governors opens Poetics of Light (April 26, 2014–March 2015), an exhibition of images from the museum’s collection—the world’s largest— of pinhole photographs. The show, which coincides with Worldwide Pinhole Photography Day (April 27), presents more than 200 photographs and 40 cameras in the museum’s Herzstein Gallery. The Museum of New Mexico Press has also published a companion book for the exhibition. Turquoise, Water, Sky: The Stone and Its Meaning opens at the Museum of Indian Arts and Culture (April 13, 2014–March 2016), examining the geology, mining, and history of the gemstone. The exhibition also explores themes of authenticity and value, while noting major Native American, Spanish, and Moorish influences on turquoise jewelry design. McLarry Fine Art, in Santa Fe, hosts Treasures from the Artist’s Vault, a retrospective of watercolors and other work by late Nambé artist Richard C. Sandoval— a former art director and editor for New Mexico Magazine. En la Cocina with San Pascual (through June), at the National Hispanic Cultural Center, in Albuquerque, honors the patron saint of cooks and kitchens with more than 75 works by New Mexico artists. At Albuquerque’s Richard Levy Gallery, photographer Manjari Sharma’s elaborate and colorful representations of Hindu deities are on display (through April 11) in an exhibit titled Darshan. Sharma and a team of 35 craftspeople created props, sets, prosthetics, makeup, and costumes to develop highly stylized C-print images of Ganesh, Lord Shiva, and others. The Expo New Mexico Fine Arts Building hosts the InSight Women’s Photography Exhibit and Sale (April 5–27), featuring more than 100 jury-selected images by New Mexico women photographers. In Truth or Consequences, the Second Saturday Art Hop (April 12, 6–9 p.m.) is a great way to experience the galleries and other businesses in this quirky, enchanting town. Walk-weary visitors can always hire a horse-drawn buggy for a dollar. In Las Cruces, the Las Cruces Museum of Art celebrates the city’s talented young student artists with its All-City High School Senior Art Exhibition (April 11–19). Also in Las Cruces, the Branigan Cultural Center presents an exhibition of rodeo photographs by Mel Stone (April 4–26), in conjunction with the Las Cruces Country Music Festival (see p. 14). In Deming, the Deming Arts Center presents a two-woman show featuring work by glass sculptor Patricia Schneider and portraitist Cynthia Gutierrez. In a letter from one artist to another, Robert Henri expressed this powerful sentiment to John Sloan, describing the kind of impact Santa Fe can have on people. Written in 1920, it could just as easily have been written yesterday. This phenomenon may help explain how Santa Fe’s appeal has come to extend far beyond the state line, and why references to it appear in all variety of unexpected locations. When the New Mexico Museum of Art unveils its new exhibition, Southwestern Allure: The Art of the Santa Fe Art Colony, on April 25, New Mexicans will have the chance to witness a singular example of Santa Fe’s long reach. In a surprising twist, the show is part of a traveling exhibit that premiered at a Florida museum. The term “Santa Fe art colony” was coined by journalists in the early twentieth century to describe the influx of Anglo artists to the capital city. In reality, the artists who worked in Santa Fe constituted a diverse group with different backgrounds and styles. They did not come to join a colony, but rather were united by the desire to work in a locale that offered something different. Santa Fe’s unique blend of cultures, architecture, and landscape and the Museum of New Mexico all played a role. Some artists, such as Gustave Baumann and Fremont Ellis, settled for their entire lives, while others, like B.J.O. Nordfeldt, moved on. Interestingly, even part-timers and visitors are included in the exhibit because of their stature in the wider art world and because of the work they produced during their visits. These include John Sloan, Marsden Hartley, and Edward Hopper. Southwestern Allure was developed for the Boca Museum of Art, in Boca Raton. Curator Valerie Ann Leeds suggested it to the museum’s former director, George Bolge, after he told her of his interest in presenting an exhibit of Southwestern art. He assured her there was strong interest in the subject among the museum’s patrons. While there are many artists who could be included in such an exhibit, Leeds wanted to create a show that focused exclusively on the formative period of Santa Fe’s art community. Southwestern Allure presents a full spectrum of art from the most notable of Santa Fe’s Anglo artists, who worked in the region from 1904 through 1938. Since the artists range from American art stars to lesserknown but beloved regional artists, this is a rare opportunity to see this combination of work together in one exhibit. One of the biggest names in the show is Edward Hopper, known for his iconic urban scenes. On a single visit to Santa Fe in 1925, Hopper worked only in watercolor and produced 13 paintings. If we think of his famous images in which architectural geometry is set off by stark lighting and shadows, we will immediately sense the same artist at work in Ranch House, Santa Fe. In his depiction of a whitewashed adobe ranch house, there is again the sense of quiet isolation— not a person in sight—and the lines formed by the building’s corners and front colonnade receding into the distance create an angular perspective and interest similar to that aroused by his urban scenes. Ranch House, Santa Fe, by Edward Hopper, 1925. Watercolor over pencil on paper, Williams College Museum of Art. Bequest of Lawrence H. Bloedel, Class of 1923. Hopper was a former student of Robert Henri, who looms large in the development of the Santa Fe art colony, due to his friendship with Edgar Lee Hewett, first director of the Museum of New Mexico. Henri worked in Santa Fe during three visits between 1916 and 1922, creating a large number of portraits and additional scenes. Henri exhibited in the art museum’s inaugural exhibition in 1917 and encouraged his friends to join him and show the results of their work in that exhibit. Both George Bellows and Leon Kroll made the trip in 1917 and displayed their work in Santa Fe’s museum. Works included Bellows’ Santuario de Chimayó, which is featured in Southwestern Allure. Bellows, who became known as one of the Ashcan School realists, shows Chimayó’s revered Santuario as the backdrop for wagons and grazing horses. 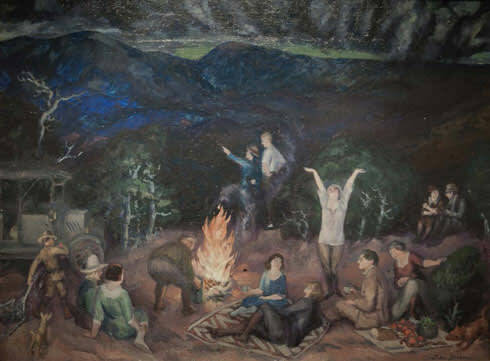 No exhibit of the Santa Fe art colony would be complete without including Los Cinco Pintores, the group of five young artists—Will Shuster, Willard Nash, Fremont Ellis, Jozef Bakos, and Walter Mruk—who came together in Santa Fe from 1921 to 1926. For Southwestern Allure, Leeds has selected an interesting compilation of their work, with examples showing what some of the members were doing just prior to the group’s formation. For example, Jozef Bakos’s strong 1920 painting Rancho de Vallecitos shows the artist working in a Modernist mode, with bold colors applied to rustic buildings and fences with jaunty, off-kilter lines set between the smooth forms of a white horse and a dark burro in the foreground and mountains rising behind. Stacia Lewandowski is the author of Light, Landscape and the Creative Quest: Early Artists of Santa Fe, available at the New Mexico Magazine Store (shop.nmmagazine.com). About the main image on this page: Picnic on the Ridge, by John French Sloan, 1920. Oil on canvas, private collection, Los Angeles.